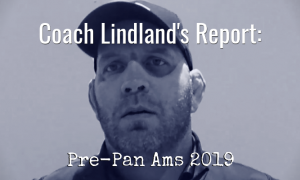 Five Point Move is proud to host US Greco Roman National Team Head Coach Matt Lindland every week for “Coach Lindland’s Report.” For fans and wrestlers looking for insights regarding the US Greco National Team, we ask Coach Lindland questions pertaining to recent events, training, and other topics surrounding the sport of Greco Roman. If you have any questions you’d like us to ask going forward, let us know via Facebook, Twitter, or through our Contact page. This week is the opening of the 2017 Winter Greco Roman Camp at the Olympic Training Center. If you have been following along the last couple of Coach’s Reports, you know that US National Team head coach Matt Lindland is introducing a new analogous theme centered around athletes “being in the boat and paddling”, a concept near and dear to the coach’s heart due to his passion for whitewater rafting. Of course, the craziness of forced par terre coming back and the new weight classes is also brought up. And to close it out, a fairly well-known but entertaining story that comes with an important lesson. 5PM: Camp opens this week. You have the new theme, which we’ve talked about. With the beginning of a camp like this one, do you introduce your ideas and objectives right off the bat, or do you work it all in gradually throughout the two weeks? Coach Matt Lindland: I’ve been trying to share the message on tours as well as at the training center here, so the theme is getting out there. But yeah, we’re going to have a sit-down presentation and I’m going to get up and talk about why all of the analogies make sense and the lessons I’ve learned throughout wrestling, the lessons I’ve learned racing whitewater, and how they really apply to each other. How we can use those analogies about getting the six men in the boat and paddling together in sync. I think that is really important for building the culture, so we’re going to actually have a sit-down presentation to talk about that during the first week. The second week, we are going over to Fort Carson and get in the pool at the Iron Horse Rec Center over there with the dive team. As you know, we’ve done some training with the Special Forces and helped them with their hand-to-hand combat. You know, I got to learn as much as they did that day, fortunately. I love martial arts training and when I get into real-life scenarios and I see what their needs are, how they interpret situations, and the way they look at things is completely different than how you would for a sport. So I got a chance to learn from them and share with them. When I told those guys I needed a pool, they were very helpful. Not only are they getting us a pool but also, the boats and the paddles. We’re going to take what we talked about in more of a classroom lecture setting and go to the pool for three hours. We’ll do a lot of team-building and exercises. Frankly, it’s a lot of work (laughs). I’ve talked before about what you are willing to suffer for, and I’m willing suffer through the hard work of getting the boats pumped up and into the water, like I do with whitewater. 5PM: For the guys who train at other places away from the Olympic Training Center, wherever they are, as the overwatch of the program, how do you go about keeping athletes on book with the theme and goals of the camp? ML: Well, I don’t think that the concept is foreign to anybody. As a team, you have to work together. We’re separate individual athletes, hence the one paddle per athlete analogy, but we’re also separate clubs. But when we come together and we are Team USA, whether it’s for this camp or a winter tour or to represent the United States at the Olympic Games or the World Championships, we are one team. And whoever gets in that boat has to be in-sync and paddle together. There are only six spots on the Olympic team. We can talk about eight spots this year, potentially ten spots next year, but we know for sure come 2020, there are only six seats in that boat. And you want to be in the red boat. 5PM: What are going to be other focuses of the camp outside of the indoctrination of the new theme and so forth? ML: Besides releasing our theme, getting on the mat doing a lot of hard wrestling, and talking about our philosophy, we have a hockey game. I tried to roll this out a couple of years ago, my first year on staff, and I didn’t let it be known that it was mandatory. They look at it and go, Hockey game? What’s that about? And we had very little turn-out. So I am going to make it very clear that everything on the schedule is a mandatory event, our team-building as well as our hockey game. I’ve actually invited guys who used to play hockey with me. I was the Zamboni driver when I was a resident athlete here in Colorado Springs. After the last hockey game I’d open up the garage door and they’d come in and we’d get on the ice for a couple of hours. We’d get a really good workout and have a lot of fun, and I want this next generation of athletes to get an opportunity to have a great workout, get some team-bonding, have a lot of fun, and there’ll probably be some blood on the ice, but that just goes with the game (laughs). 5PM: So, in essence, this is going to be like Slapshot, but without any actual hockey skill? Coach Matt Lindland: That is exactly what it is going to be like, Slapshot without hockey skill. They are actually going to get on skates, and because not everyone comes to camp with hockey skates, we use rental skates, helmets, and broomsticks, the broom ball. Broom ball is typically played with sneakers, but we’re going to wear skates. 5PM: How was this idea originally birthed? ML: This is what we did in my generation. I rank the rink at night, I was the night manager. When I’d close it down and lock the doors, I’d let all the wrestlers in the back Zamboni door and we’d play hockey. 5PM: Yeah, but when you did this years ago, were people into it? Because I’d imagine if you never played hockey before or ice skated, it would seem rather daunting. ML: Well you know what, I think that is kind of the point. You are out of your comfort zone. You’re not a hockey player. How many things not only in sport, but in life, do you have to do that are uncomfortable? I mean, there are hard conversations that you have to have with athletes, or your boss, or whomever, but there are so many difficult things you’re going to have to do and you have to overcome those. What better way to do it than by actually starting to do it and realizing it’s fun and how if you didn’t try, you would not have had the opportunity to experience something new? To have fun with your teammates and getting a great workout in. 5PM: We reported it, so it is out there, and that is the addition of a couple non-Olympic weights starting in 2018. Do you think that for the current climate of the sport, having ten weight classes in non-Olympic years, is a positive sign? People have been talking about wanting more weights, well, here they are. ML: I think it’s exciting for the sport. It is more opportunities for the guys to get on teams, more opportunities for guys to get the chance to compete at that level and potentially medal at the World Championships. It’s exciting, for sure. I think it’s exciting for our sport. 5PM: Okay and obviously, the second part of that would have to do with par terre being re-instituted in some way, shape, or form. I think we’re all assuming it’s going to be enforced just like it was most recently. Nevertheless, a lot of people were actually celebrating this news. What I’m wondering is that since there wasn’t a lapse, as a coach, is this almost a non-issue? It doesn’t seem that you’d have to restructure a curriculum all of the sudden. ML: No, I think, even though there was no more forced par terre, you didn’t abandon par terre wrestling. You could still take an athlete down and you want to be able to turn him and hopefully finish the match on top. And if you do get taken down, you have to re-set and get in the proper defensive mode, stop the guy on top, get back on your feet, and re-gain those points from when you got taken down. You know, I think there were guys who were excited because they feel like they are strong feet wrestlers. But I mean, the rules are going to be what they are and we have to compete under them and figure out a a strategy for when the rules actually come down from UWW. I don’t know when that is going to be. It could be as early as Schultz. Right now, I have no idea what set of rules we’re working under because they have not officially been released. What we’ve been hearing is what went down at the UWW congress and that was essentially a bunch of things getting thrown around. 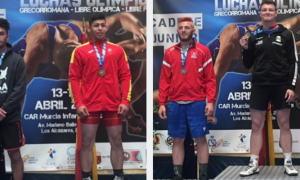 One was the weight classes, the other was forced par terre, and making the weight classes the same for each style of wrestling. I never understood why freestyle was 74 (kilograms) and Greco was 75 and up and down the line. I would think you’d want to the sport to look as similar as possible except for the styles, you know? The same uniform, the same weight classes, the same procedures. I think that makes for a more unified sport and you get more crossover between the fans. 5PM: Speaking of fans, Greco’s governance is based a lot on viewership. Do you think fans in general want to see par terre wrestling? I can tell you from 5PM’s perspective, the response has been overall pretty positive from fans in terms of par terre’s return. Coach Matt Lindland: Well, I think the fans want to see exciting wrestling, period. The problem with the rules is that I don’t think we allowed enough time for the no forced par terre. I think if we allowed those rules to mature and develop… You have to understand, you just took a bunch of guys who for the last four years had been wrestling with a set of rules and told them to stop blocking and waiting for a chance on top, essentially. 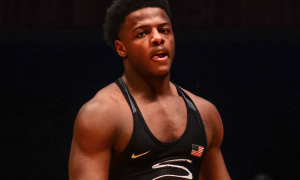 And what you saw was a lot of the younger athletes going out there and scoring points, guys who had been wrestling at the Junior and Cadet levels and understand these rules and understand that you have to attack on your feet to score points. So I think we didn’t give the rule change enough time, first of all. Do I like par terre? Yes, I made a living out of par terre, it’s how I won my matches and got my medals, by lifting guys. I lifted everyone in the Olympics except for my finals match (against Murat Kardanov). And then the next year, I had (Aleksandr) Menshikov in the semifinals and lifted him for five to get into the finals of the World Championships. So yeah, I think it’s exciting, but I think we can make this sport exciting. I think it is our job as athletes and coaches to not only win, but to make it an attractive sport for viewers and hopefully get us on television. I know that UWW is working on some big deals in Europe and potentially in Saudi Arabia and other places in the Middle East to show this content. They like that fighting culture, in the Middle East and Europe. It hasn’t caught on as much in the United States, we have the UFC, boxing, and the NCAA’s, but combat sports all over the world are huge, so I think we have to present our sport as best as we can with whatever is going to make our sport most exciting. I don’t know if par terre isn’t or is (exciting), but what’s going on, in my opinion, is that we were seeing a lot of guys not even attempting to score on their feet and just waiting for the opportunity to get on top. So we didn’t see exciting wrestling on our feet. The only thing exciting was the par terre (laughs). The current fans are like, Don’t take THAT away from us! Does that make sense to you? 5PM: Absolutely, in fact yesterday a few people on social media basically said the same thing, that at least with par terre there was scoring. ML: But that is just because of the rule-set. If you change the rules, we are going to have to force ourselves to score in other positions, which I think is my point. 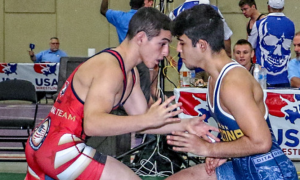 If there is no forced par terre, then we have to teach our athletes how to get to the body, how to headlock, how to arm throw, how to score points from open wrestling. 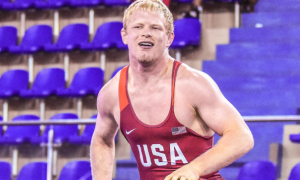 But what we’re seeing in Greco right now is a lot of blocking, a lot of head-down, and we are not seeing the chest-to-chest fighting that will produce the throws on our feet. 5PM: Whenever there is an event overseas or a tour, the general kind of question we get from fans is how are wrestlers selected for these trips. Stuff like, “How come this guy is going and not this guy?” Obviously, athlete availability plays a role, but would you care to shed some light into this process? ML: I think that is a big point. Every coach and club coach has their own plan. If there is a tour going on and it interferes. For example, WCAP, they get a lot of their funding by winning nationally and getting their guys on teams, so they want to win just as much domestically as they do internationally. And it’s a struggle, because of course, we want to get our best guys overseas but if their coach has a plan, then of course, we will respect that plan and take somebody else if we already have a tour scheduled. We’ve also had conflicts with scheduling of the Armed Forces Cup, because it goes over the Denmark tour this year. So a lot of it is availability of the athletes, the athletes who are healthy, and sometimes it is because you see potential in guys and you want to get them opportunities overseas. What a lot of people do not understand is that some trips are club-funded, some are self-funded, and some are funded by the National Team. And we don’t release who is paying for the tours, so you might see some people on there and go, Why is that guy on this tour, he’s not very high up. Well, maybe his club wants to give him a push or maybe his family has deep pockets. So there is a lot going on relative to what you are seeing in the lineups for these tours overseas. 5PM: And finally, a student of yours, Chael Sonnen, is fighting this weekend and it inspires this question. Chael has told a story about you essentially trying to fight Filiberto Azcuy in the parking lot following the Pan Ams. It’s a funny story, but there is a lesson to be gleaned from this anecdote. Care to elaborate? ML: Sure, I’d be happy to re-tell the story. Other students of mine love stories like this. I think the point is, at the end of the match I knocked out a couple of Azcuy’s teeth. He won the match but at the end of the day, I felt like I won the fight. And I always had a philosophy where every time I stepped on the mat, I wanted that guy to have the worst experience of his life, win, lose, or draw. I wanted him to never want to wrestle me again. To have it in the back of his head. I just wanted him to understand that next time we wrestle, I’m going to knock more teeth out and he’ll be spitting more Chicklets. But it is a mentality that you have when you step on the mat and I see it from some of our guys and I don’t see it from others. I try to encourage that and I try to develop that. You want to instill fear into your opponents that you can score, that you can punish them, that you will push their cardio… Every aspect of the game, you want them to say, “Oh shoot, I drew Matt. This is not the guy I wanted to draw first round.” And I think that is a lesson to be learned for a lot of our young athletes. 5PM: How does a young athlete come to that though? Is this learned behavior or do some have it naturally inside of them? Coach Matt Lindland: I don’t think anybody arrives naturally at that, I think it has to be developed by doing hard things. You asked me a question earlier about why am I putting wrestlers on skates and getting them on the ice. Because it’s a hard thing for them. It’s a hard thing. It is uncomfortable for them. They don’t necessarily want to do that but it’s something they need to overcome. They need to do hard things. All of our lives, men should do hard things. We should do difficult, arduous tasks to develop the stamina to be mentally tough. 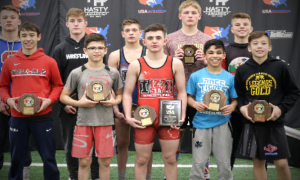 Be sure to follow Coach Matt Lindland on Facebook, Twitter, and his official blog for updates on the US Greco Roman Wrestling program heading into the new competitive cycle.